Baseball scribes made a few references during this postseason to the fact that the last time a visiting team won a Game 7 in a World Series, it was when the Pittsburgh Pirates defeated the Baltimore Orioles in the 1979 classic. Of course, we were acutely aware that we were running this daily Scoreboard easter egg on the site, and thought it would be a great coincidence to follow up a Texas Rangers win in St. Louis by finishing our 13th Legendary Game to match. Alas, the Cardinals took the 2011 Series in stunning fashion, and the We Are Family Pirates remain the holder of this interesting distinction. As this final scoreboard shows, Kent Tekulve finished off pinch hitter Pat Kelly for the final out, inducing a lazy flyball that landed in the glove of the speedy centerfielder Omar Moreno, and we are left to marvel at the lasting legacy that Chuck Tanner’s club embedded in our brains. The Black and Gold Bucs had a unique charisma that young fans in that era had rarely seen on the World Series stage, especially coming off back to back years of Yankees vs Dodgers, a matchup of the traditional powerhouses. It is arguable that if you were to randomly ask fans who were in their formative years at that time to recall their top 5 most memorable teams, these Pirates would appear on a majority of the ballots. This team had larger than life superstars in Willie “Pops” Stargell and Dave “Cobra” Parker. There was the stringbean reliever with the glasses and the submarine delivery, Kent Tekulve, who made everyone wonder if their math teacher had somehow found a sinkerball. Then there were the intangibles that caught the attention of casual fans including the pillbox hats with the “Stargell Stars” to represent good play on the field, multiple uniform variations and of course the theme song, Sister Sledge’s disco hit We Are Family. But as readers of this site have come to know, these Legendary Games are usually picked because they have a particular personal meaning. It just so happens that 1979 was the year that my high school buddy Jerry Lyons and I decided to coach a Little League baseball team, and were assigned a team named the Pirates. In a somewhat rash decision one day at school (rash considering I didn’t even have a driver license at the time, so Mom had to drive the coach and a player to games and practices – Thx Mom! ), we offered up our services for teaching the finer elements of the game to 11 – 12 year olds. 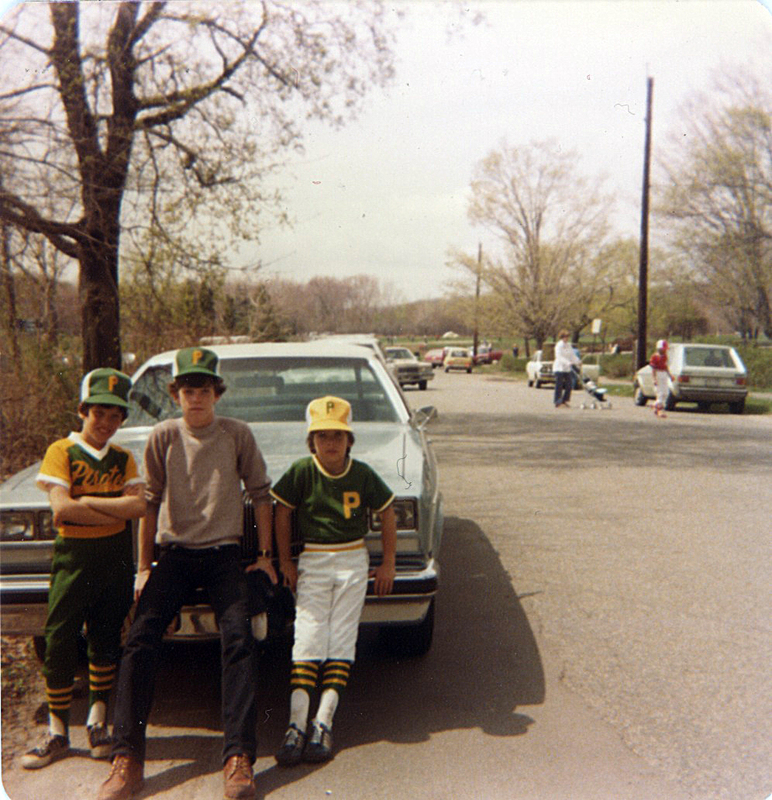 This is a picture of me with my brother Eric on the left, and my brother Scott on the right who joined the team the following season but coincidentally played for a “P” team called Pawtucket when this picture was taken. We didn’t have a very successful first campaign, but there are a couple of significant moments that we remember quite well from the experience. In our first player draft we were obviously overmatched by the adults in the room concerning nepotism and favoritism, but we turned some heads when we made a controversial selection with our first pick. It was a pick that paid big dividends the following season. We drafted a kid named Joe Walsh, who was big and athletic, but since he was on the young side of the age range would have lasted until later rounds in the draft. We grabbed him early. Joe stayed with us through our two seasons and blossomed into an All-Star and dominant force in the league. Turns out he attended my college Alma Mater 6 years later. The other prominent experience was a situation that pitted us against a player’s father, and is one of those life’s lesson moments that happen from time to time. His son had been one of our starting pitchers throughout the season and contributed significantly on the field. Jerry and I had been nurturing another player along who had become a second reliable starter, not very competitive but he could get the ball over the plate consistently. As the season wound down circumstances presented us with a need to win the final game (I can’t remember the reasoning now, but it must have been for some seeding purposes or something, it certainly wasn’t for a pennant). Jerry and I consulted and decided we would give the ball to the second starter. He confronted us on the field while we were warming up the players and putting them through infield drills. We calmly told him our reasons for the decision and why we felt like the team was better off going with this lineup. We were 15 years old, kids ourselves really. Our style of managing was always about having fun. Didn’t get a hit? That’s ok, at least you ran hard down the baseline. Cheer on the other guys and recognize the improvement they’ve made over the season! We weren’t in it for the winning …. we were in it for the love of the game. The season ended, I can’t even remember the outcome of that game because it really didn’t matter. Dad removed his son from our team the next season and I used the details of that story to demonstrate how I “handle adversity” during my college interviews. My brother Scott joined us to drive in some runs at the top of the order, hitting behind my brother Eric leading off as a rare lefty in our lineup. Joe hit cleanup and mashed some mammoth home runs and our record improved quite a bit. I got my license and could drive myself to games. And oh yeah .. our League got us some cool new uniforms that looked like one of the versions from the World Champion Pittsburgh Pirates. We hope you enjoy these little games that we present .. tomorrow we start our 14th Legendary Game. Let us know in the comments if you have any guesses as to which Game we are presenting. The first to guess correctly gets a Baseballisms t-shirt! We would also like to thank a couple of web sites that are so valuable to pulling these Legendary Games together. The Baseball Almanac helps us with the rosters and uniform numbers, while the extraordinary Baseball-Reference gives us the play by play accounts of the game. Thanks again for all of your awesome work! We would love to hear from you. 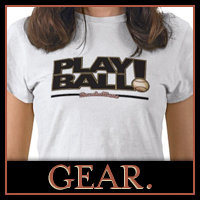 Send a Tweet to @baseballisms with a quick message, send us an email or visit the Your Own Story page. We look forward to growing a community of fans interested in the poetry of the game of baseball! Loved the story about the Pirates, at both the major league and little league levels. 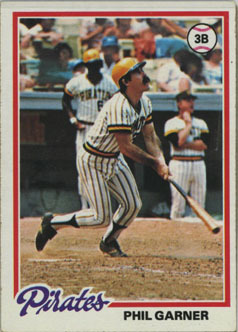 My favorite story from that Series was about Bruce Kison, who started Game 1 for the Pirates, surrendered five runs in the first inning, and never pitched again in the Series. But it all ended up OK for the Pirates, anyway. They really were a zeitgeist team for the late 1970s, weren’t they? I was in 10th grade when this Series was played. I rooted for the Pirates, my friend, Larry, preferred the Orioles. As we rode the bus to school each morning of the Series, it looked bleak for the Bucs. Larry kept asking me to pay up, ’cause we had made a five dollar bet in advance about who would win. I have to admit that when the Pirates were down 3 games to 1, I almost paid up. When the Pirates made their extraordinary comeback and took the Series, I never even asked Larry to pay up. I was just so excited they had won. To this day, Larry owes me five dollars. With interest, we are probably up to around 28 dollars. 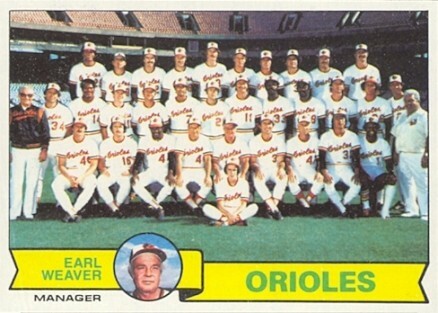 But that was one memorable Series, and it did somehow catch the flavor of the ’70’s.